7 Bedroom Detached House For Sale in Newquay for Guide Price £1,500,000. Rosewastis Farmhouse is an exceptional Grade II listed Georgian farmhouse located centrally within its plot providing the most impressive far reaching rural views over both its own 15 acres of pasture land and the open farmland beyond. Located on the popular North Cornish Coast this delightful property is nestled beautifully into its surroundings yet offering extremely convenient access to the A30 and all the amenities the North Coast has to offer. The farmhouse itself is entered through a large timber door leading to an L-Shaped entrance hallway which leads to the majority of the ground floor accommodation. The main living hub of this outstanding home is the open plan kitchen / living / dining area which measures in excess of 26ft in length. The kitchen part of this room is centered around a large central island unit which doubles up as a 4 person breakfast bar. Within the central island unit there is an integral wine cooler with wine rack either side of the cooler. There is a large double fireplace which houses a double Aga as well as a food preparation table in addition with a Belfast sink nestled in the corner. Also within the kitchen area is a large bank of timber full height cupboards offering a fantastic array of storage for kitchen utensils and cutlery / plates etc. Within the living area of this room is a charming open fireplace with focal wood burning stove which the vendors have created a delightful seating area set around this location. Adjacent to this area is a perfect location for a large dining table set by the window providing exceptional views over the open pasture land. Within this area a secondary staircase provides access to the first floor landing as well as a timber door providing access to a raised terrace with steps descending to the gardens and grounds. The formal drawing room is set on the eastern side of the property and is of generous proportions. There is a central focal fireplace with inset wood burning stove and a sash window overlooking the side elevation. In terms of additional reception rooms there are a further 2 on the ground floor which are currently being used as a snug and a music room. Both of these reception rooms are light, airy and spacious with the snug having an open fireplace with inset wood burning stove. The snug could also be utilised as a formal dining room if required due to its proximity to the kitchen area. Further rooms on the ground floor include a spacious utility room located just off the kitchen area which provides ample space for kitchen appliances and additional storage space. There is also generous work surface space within the utility together with a large Belfast sink. There are three large store areas on the ground floor including a generous boot room, a store room currently being used as a small study and a rear porch which incorporates the boiler room and also provides a sink and drainer, perfect for access to the gardens. Completing the ground floor accommodation is a wet room / cloakroom WC set at the northern side of the property and tucked nicely out of the way. A descending staircase leads to the lower ground floor to a Cellar which is currently being used as a games room. This area could easily be converted to a gymnasium or cinema room or simply used as additional storage. There is good head height within the cellar and a rear courtesy door provides access to the gardens and grounds. At first floor level there are 7 bedrooms in total with two family bathrooms. All bedrooms are of a fantastic size and over differing views over the surrounding pasture land and far reaching views. The detached garage block consists of 3 self contained large garaging areas which are all heated via radiators. Within one of the garages there is a door at the rear which leads to the garden room and cloakroom wc which sits at the back of this area. At first floor level there are a number of rooms which are currently being used by the current vendors as an area to operate a business from home. These rooms could be converted into a self contained apartment with a little bit of reconfiguration. The garden room which sits at the back of the garage block is a beautifully completed room with floor to ceiling glass capturing the fantastic views across the open pasture land and surrounding farmland. Within this area is a kitchen area with integrated dishwasher and fridge together with sink and drainer. There is also a cloakroom / WC set within this area as well as access to a patio area which also enjoys outstanding far reaching rural views. The property is located within the middle of its grounds which extend to some 14 acres of pasture land. Immediately surrounding the main farmhouse is some formal gardens which are all laid to lawn with a range of mature planting and shrubs offering privacy and seclusion. The pasture land sits mainly to the northern and western sides of the farmhouse and are L-Shaped. To the front of the farmhouse there is an enclosed area of grass where currently the chickens are located. Within this area there is a foot print of a previous dwelling which was derelict when our clint purchased the property. Subject to the neccessary planning permission and building regulations required it may be possible to create an additional property in this location. There are various options available to sell off the land if it is not required to neighbouring farmers. If this is something that interests you then please contact the agents for further discussions. 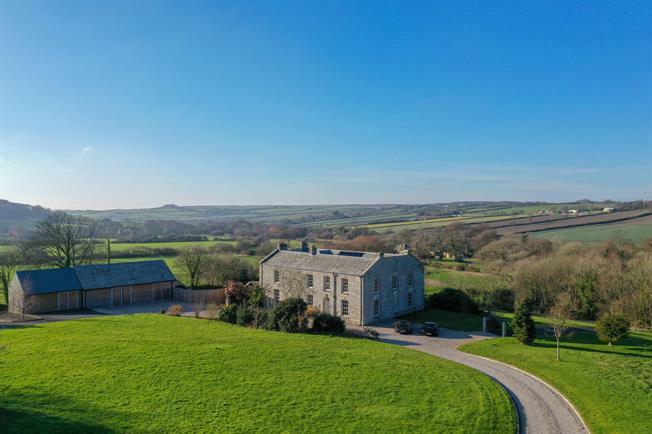 Rosewastis Farmhouse is centrally located in a private yet easily accessible part of north Cornwall which is within easy access by road, air and rail transport links. The beaches of north Cornwall are favoured by families and known the world over for their surf. The area is also a haven for golfers with the Championship course of Trevose nearby at Padstow and the renowned St Enodoc at Rock, as well as further excellent clubs at both Newquay and Perranporth. The following services are available mains electric, mains gas, metered mains water, mains drainage and telephone line is connected (however we have not verified connection). Mains gas condensing boiler providing both the hot water and central heating via radiators heating on both ground and first floor levels.There is a septic tank which services one bathroom in the main farmhouse.